The annual reenactment of one of the most significant moments in revolutionary history started out as a sword-swallower’s publicity stunt more than half a century ago. 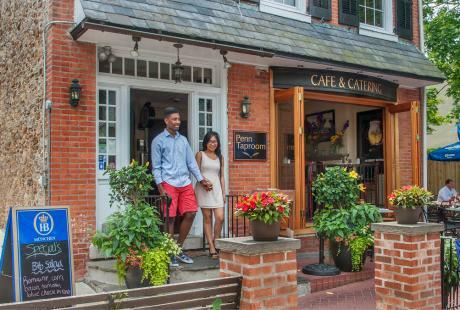 Fast forward through the years and an Olympic gold medalist, unofficial “Hessian troops” and mischievous fraternity brothers have all made an appearance in this iconic Bucks County event. It has become an annual tradition and one you won’t want to miss this year on December 10 and Christmas Day. 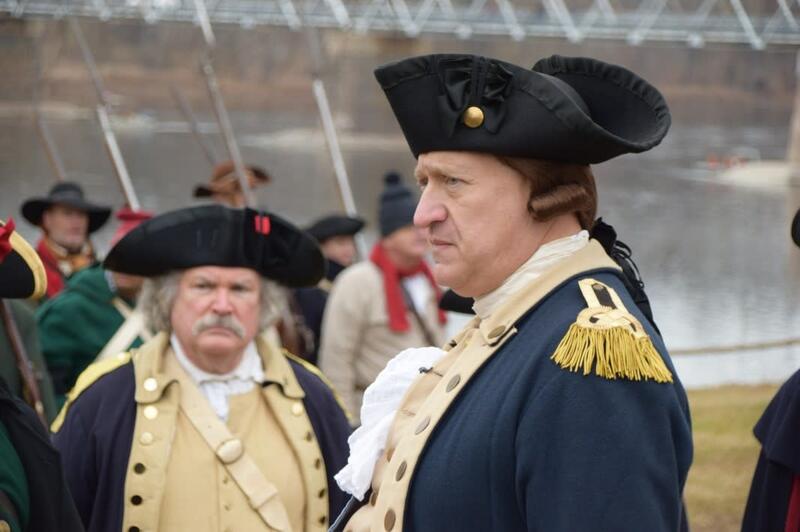 For me, the historic reenactment at Washington Crossing Historic Park is a holiday staple. Seeing the recreation of a night so significant to our history – a night that allowed Washington and his men to launch a surprise attack against the Hessians and claim victory at the Battle of Trenton – take place in the exact same spot over 200 years later is nothing short of amazing. 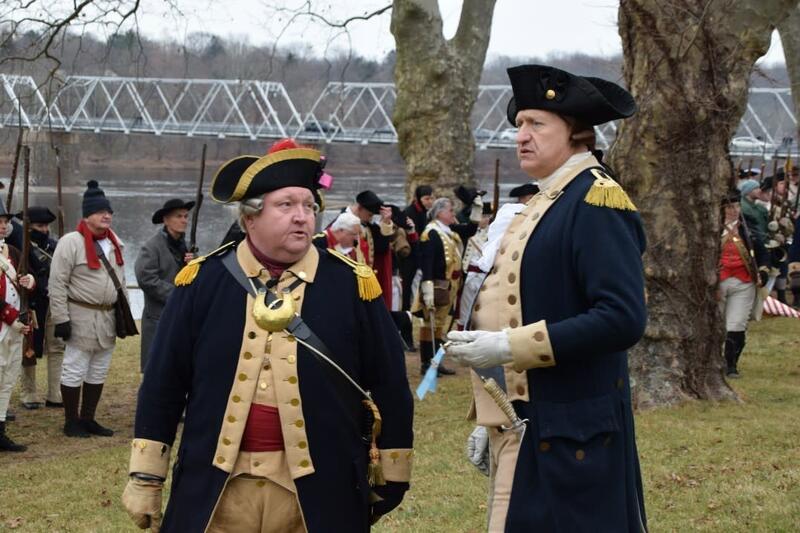 So it was a pleasure to recently learn the history behind this 65-year-old event from Joe Capone, Executive Director of Friends of Washington Crossing Park. 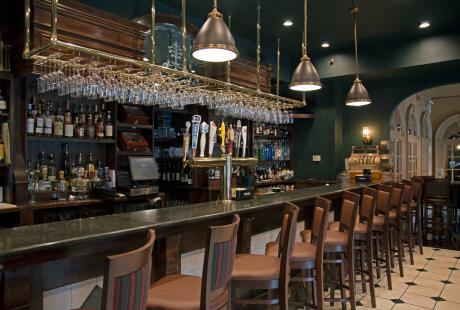 It all started in 1952 with St. John (pronounced Sinjin) Terrell of Lambertville, New Jersey. Head of the Lambertville Music Circus and a circus man himself, Terrell understood the importance of good publicity. “He jokingly mentioned during a speech that George Washington was going to cross the Delaware and word made it to the editor of the local newspaper.” Capone said. Seeing no choice but to follow through, he gathered a few good friends, donned historic garb and made the first organized crossing to commemorate that wintery night in 1776. For the next 25 years, Terrell played George Washington in what became an annual tradition. 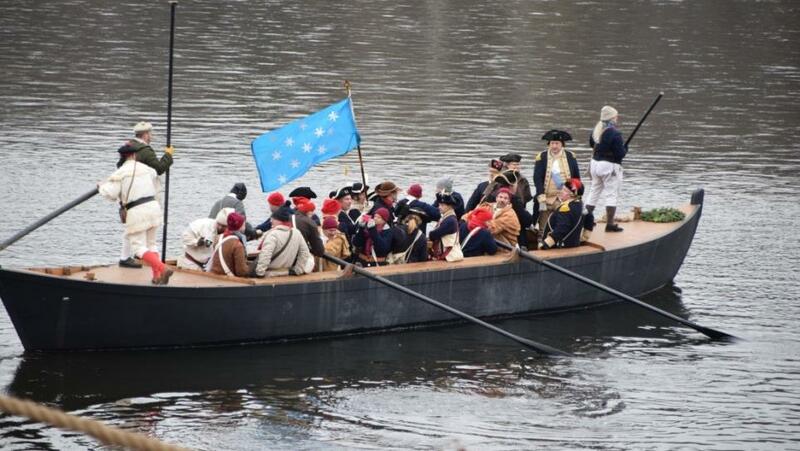 A few years into his gig, the Washington Crossing Historic Park Commission stepped in and together they teamed up to make the reenactment more historically accurate, including the building of seven 45-foot long Durham boats – reproductions of vessels Washington and his troops used to cross the river more than 240 years ago. They also ensured a more accurate representation of the troops. 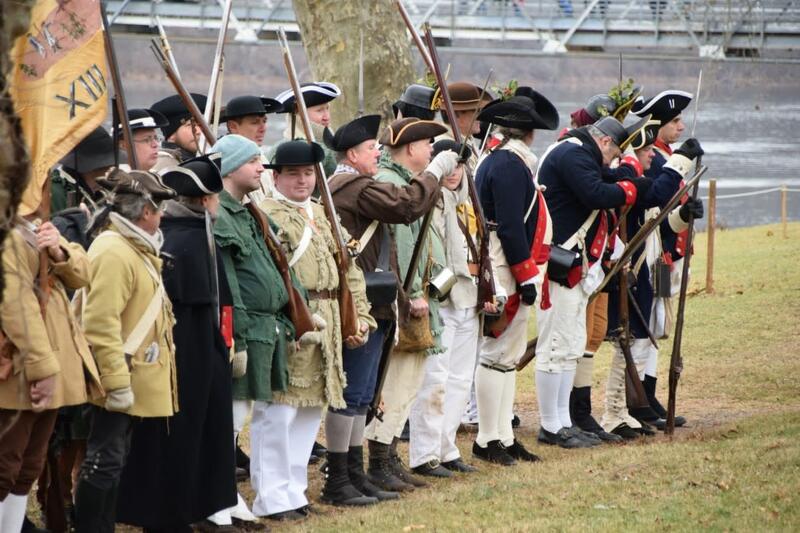 The nearly 300 reenactors who participate each year are required to dress in either period civilian dress or military garb referred to as kit. The event has come a long way since its humble beginnings, but Capone still laughs as he remembers some of the comical moments from earlier days. One year, a group of unofficial participants tried to portray Hessian soldiers on the other side of the river. And in one of the earlier attempts at a crossing, local fraternity brothers from Rider University had their pledges dress up and take to the water. Another former participant worth noting is the successor to Terrell, who retired from portraying Washington in 1977. Brother to Princess Grace Kelly and Olympic gold medalist rower, Jack Kelly, took on the role from 1978 to 1984. 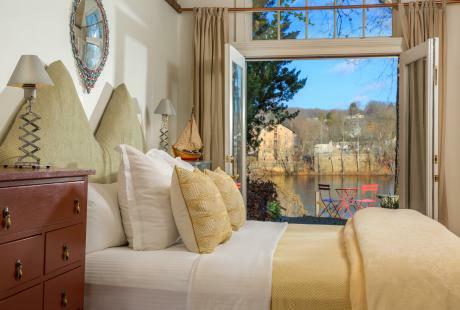 Over the years, the event has become one of Bucks County’s most popular events and for many, a Christmas tradition. 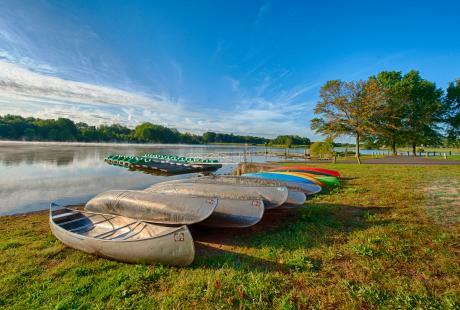 Since Terrell’s first audience of a few members of the press, thousands now gather on the shores of the Delaware each year. As the size of the crowd grows larger, the event itself has to expand as well. 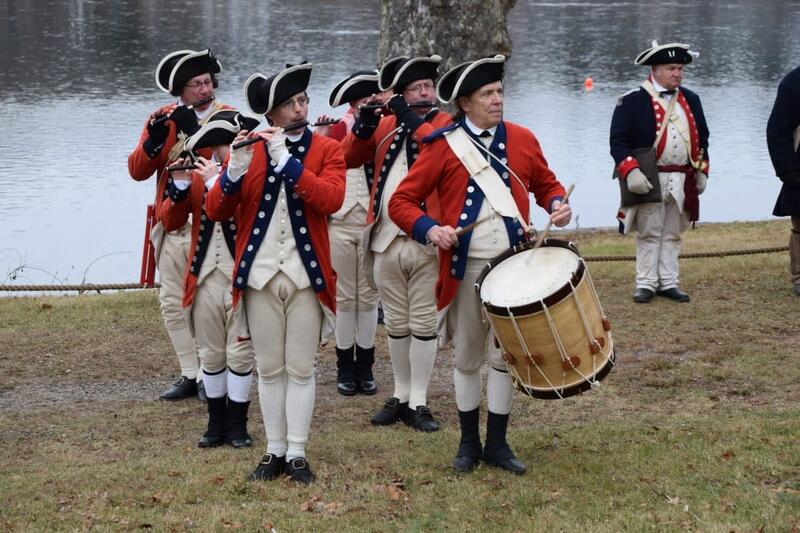 This year attendees of December 10 crossing can now enjoy activities starting at 10 a.m., including fife and drum corps performances, cooking demonstrations of 18th century dishes, an operating blacksmith shop and wandering carolers. Also added to both crossings this year is a narrator role who will describe the historic events taking place to the crowd. Both the December 10 and Christmas Day crossings will take place at 1 p.m., but I suggest arriving early for a good viewing spot. Although I prefer to watch from the shore, there are also a few tickets left to watch the event from a seat in the heated VIP tent. For these tickets and more information about the crossing visit their website. 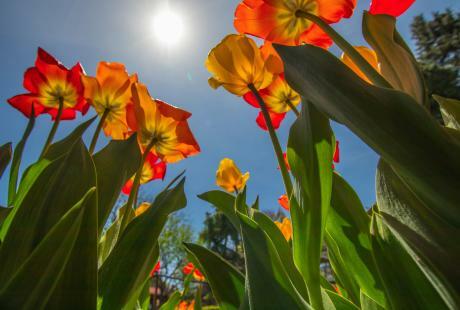 Brooke Hillman is a writer and self-taught photographer based in Bucks County, PA. Instilled with a fierce love of Bucks County since childhood, Brooke loves sharing her hometown and its hidden gems with others. She’s a book nerd, travel addict and nature lover with a serious craving for the next adventure. She has a passion for exploring the world around her and hopes to inspire others to do the same.